Camping on Mount Bromo for Milky Way Tour Photography. Tour package to mount bromo and see the stars of the milky way galaxy at night is best one of the tourist destinations in the mount bromo. Mt Bromo is undoubtedly on of the most popular and well known tourist attractions of East Java Province. The predawn departure and trek across the mountain’s famous ‘sand sea’, to watch the sunrise at the crater rim, has become something of a ritual, enacted daily by all visitors. But apart from that there is a natural beauty in bromo mountain that is not widely known by most tourists, that is camp on the mountain bromo to take a picture of the Milky Way Galaxy in the area of Mount Bromo. Pick you up by Private Car from Surabaya Airport or Hotel or Train Station then drive to Cemoro Lawang area for 3,5 hours driving. Reach parking area at cemoro lawang villages, continue visit the highest peak point 1 with the Jeep 4WD then make a tent and rest. In Midnight time, Enjoy the Milky Way (Galaxy) using your camera (Our tour guide will accompany you to take photograph of bromo milkyway ). Take picture satisfiedly until finished about 5 AM then waiting for the sunrise bromo. Then continue visit Mount Bromo Crater ,Savana, whispering of sand. Porter to server Mount Bromo camping tour. 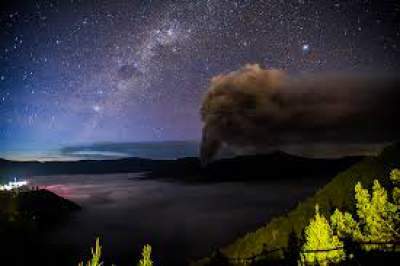 Surabayabromotour.Com Provides Camping Tour On Mount Bromo is one of the best ways to capture the phenomenon of Milky Way Galaxy or Take a Astrophotography photograph. Durations trip camping at bromo and take bromo milky way for 2 days 1 night.